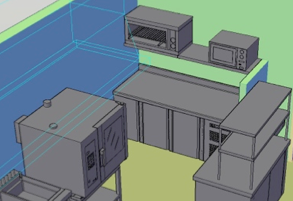 When we have to design big kitchens for groups we have big facilities with large kitchen areas to be equipped, projects in which a very thorough study must be made of the internal food transporting circuits, accesses, interrelations of the areas, etc. However, to carry out a small project we can present an estimated budget and an idea on the minimum space needs based a few simple calculations. 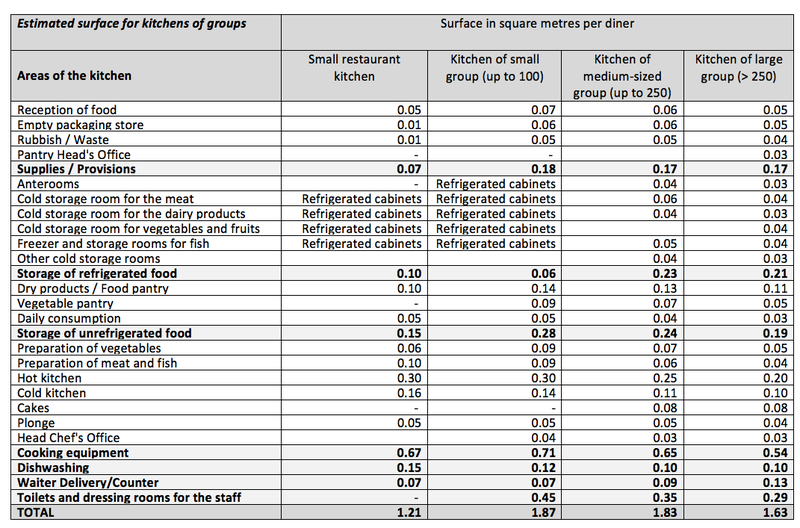 Furthermore, a simple calculation using the following table will give us an idea of the square metres our kitchen will need to be adequately designed. For a small restaurant, as in our case, the value of square metres per diner in each sitting is estimated at around 1.21. In the case of 40 diners, we will need 48.4 m2 of kitchen surface that is in keeping with the area indicated in the specifications. Reception, pantry and cold store rooms: To calculate the areas of pantries and cold store rooms we usually work with calculation formulas based on the number of diners, serving sizes, frequency of shopping, safety margins… However, these formulas become more complicated in the case of a la carte restaurants, where the amount of diners varies and the number of servings of each dish is unpredictable, depending on the a la carte orders made by the customers. In our example, the maximum amount of diners per service is calculated as 80 (2 sittings of 40) for the lunch service, and 40 for dinner, therefore making an average (60 diners) we can use the factor of 0.8 m2 for every 10 diners. Applying this to 60 diners, we estimate storage room area of: 0.8 m2 x 6 = 4.8 m2. When choosing cold storage equipment in these small restaurants, we can either go for cold storage rooms or refrigerators. Cold dish preparation area: in this area the dishes that will be served directly to the diner not passing through the cooking area, or using ingredients that have been worked on previously that will form part of the cold dishes. 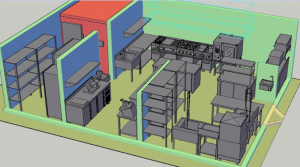 A “U” or corridor layout, with a distance between tables of 1.2 m allows two people to work in comfort in areas facing each other, making the most of the space and allowing doing different jobs or making different dishes. It is advisable to equip this area with refrigerated tables, wall shelves, and elements for cutting and slicing. It might be a good idea for different ingredients for salads, after being sliced, to be put into small tubs in a refrigerated cabinet, to make it easier to prepare the dishes. A small sink must also be considered. Preparation area: in large kitchens separate areas are usually designed for preparation and cutting meat and fish and for the potato peeling or vegetable washing areas. Given the small volume of product that compared to those handled in our case, these areas are reduced to the work surfaces near to the cooking block, where the ingredients that will be cooked are prepared and sliced. 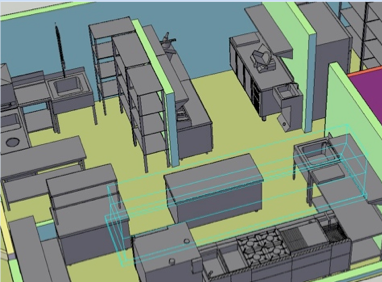 Basically this area will be equipped with open or closed work tables, wall shelves and sinks, with complementary elements for preparation, such as chopping boards, support unit with knifes and small cutter or food processors. 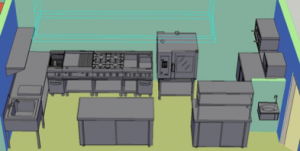 The cooking block: in these kitchens with a small surface area the best solution is to design a wall cooking block that reduces the depth of the machines, complementing the equipment with a mixed oven. There must also be an extractor hood installed that collects the cooking fumes and vapours from the machines. Given the small amount of space in this kind of kitchen, it is advisable to use the bottom areas of this block to store pots, frying pans, etc. The equipment of the cooking block must be in keeping with the dishes that are going to be on the menu. Therefore, different options can be set out when assembling the block although we can always suggest a basic set of equipment that will be made up of a stove with four burners, a roasting griddle, fryer, bain marie and a mixed oven. Plating and delivery area: as indicated above, to give a final touch to the dishes we usually work with a grille or wood-burning stove. A microwave will also allow us to heat them up quickly if necessary. 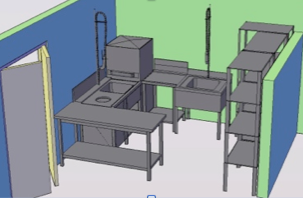 We can use a central table or unit with support shelves to place the cooked dishes and the dishes from the cold store room so that they can be picked up by the waiters and taken into the dining room. Washing area: the dirty dinner service with remains of food is left on a delivery table near to the kitchen entrance. Here the remains of food are cleaned or thrown into the rubbish bin, the plates are given a quick clean in the sink under the tap and then the plates are loaded into the baskets to then be put into the dishwasher. The calculation tables of washing productions present as a useful option for this type of restaurant installing a top loading dishwasher, that allows easily washing a standard number of 14 plates per diner (700 in total) in one hour In this area it is interesting to fit out together if possible a larger sink for cleaning pots and pans, saucepans, etc. without the need for fitting out a special plonge area. The equipment is finished off with some shelves for the dinner service, baskets and saucepans. After collecting all of the needs set out, the location of the different areas and the equipment that makes them up will depend on the dimensions of the premises fitted out as the general kitchen. Gracias por todos vuestros comentarios, ya hemos pasado vuestros datos al departamento comercial para que puedan ponerse en contacto con vosotros e informaros. ¡Saludos! Tengo un Restaurant y necesito saber sí ustedes me pueden habilitar una zona para tener hechura de tortillas a mano y por la comida habilitarla como bufetero . ¡Hola Ricardo! Gracias por tu comentario, ya hemos pasado tus datos al departamento comercial para que puedan ponerse en contacto contigo e informarte ¡Saludos! ¡Gracias por vuestros comentarios! Ya hemos pasado vuestros datos al departamento comercial para que puedan ponerse en contacto con vosotros para informaros ¡Saludos! necesito ayuda. Estoy armando un local y no se cual es la mejor alternativa para loa muros. .
Muchas gracias por el interés y la petición de información. Hemos trasladado tu solicitud a nuestro departamento comercial. En breve se pondrán en contacto contigo. Buenas tardes, estoy interesada en abrir un restaurante dentro de un hotel en Barcelona con capacidad máxima de 30 comensales, y el espacio es muy muy reducido de la cocina. Me podrían decir la superfície mínima de la cocina y almacenes, y de la maquinaria que disponen lo más pequeña posible? Muchas gracias por la petición de información. Acabamos de trasladar tu solicitud a nuestro departamento comercial para que se pongan en contacto contigo. cual es el precio de esta configuracion? Muchas gracias por la solicitud de información. Hemos trasladado tu consulta a nuestro departamento comercial, para que se pongan en contacto contigo. Hola muy buenas. Soy una estudiante de Dirección de Cocina aquí en Lugo. Estamos realizando un trabajo sobre el diseño de un negocio. Evidentemente, tenemos que empezar por la cocina. La verdad es que busqué información en diversas fuentes y esta página ha sido la más explicativa. Este es un ejemplo lo más parecido a mi propuesta de negocio, ya que pretendo crear una Casa de Turismo Rural ficticia. Me gustaría saber la cantidad de dinero invertida en este proyecto así como si disponeis de otros ejemplos que me pudieran servir de ayuda. Muchas gracias ya por adelantado. En relación a la consulta que nos realizaste hace varios días, nuestro jefe de proyectos nos ha facilitado el presupuesto de lo que podría suponer montar un restaurante de 50 comensales en el mercado español. El precio que te facilitaremos a continuación, es una estimación basada en PVP. Nota: no se incluye ninguna partida de obras de albañilería, fontanería, electricidad, climatización, ni ningún otro trabajo o apartado al margen de la maquinaria. Gracias por tu interés. Hemos remitido tu consulta a nuestro jefe de proyectos. Hola Joan, gracias por tu interés. Acabamos de remitir tu consulta a nuestro departamento comercial y en breve, se pondrán en contacto contigo. Hola Soy estudiante de Dirección de Cocina en Toledo. Estoy en segundo año y me enfrento al proyecto final. Tengo la idea de montar un “food truck”. Pienso que es un negocio poco desarrollado en España aun. Me gustaría que me pudieran dirigir con indicaciones e información que me permita completar este proyecto: instalaciones necesarias, conversión del vehículo camión, carta recomendable, presupuesto, etc. Seria muy bueno acceder a un ejemplo de proyecto ya iniciado o funcionado. En relación a la consulta que nos realizas sobre los ‘food trucks’ comentarte que vamos a publicar un apartado especializado en la próxima newsletter de Fagor Industrial. En este apartado, podrás obtener información acerca de este proyecto (planos, imágenes…) y podrás leer las opiniones de nuestros expertos. ¡No te lo puedes perder! Muchas gracias por el interés y solicitud de información. Hemos remitido tu consulta a nuestro departamento comercial. En breve, se podrán en contacto contigo para facilitarte toda la información que necesitas para equipar una cocina profesional. Tenemos un bar y el fin de demandamos comidas y cenas a ir nada 25 personas. Queríamos saber q equipación necesitaríamos (la mínima pq disponemos de un reducido presupuesto. Estoy valorando la posibilidad de montar un restaurante para unos 50 comensales. En la actualidad resido en la ciudad de Celaya, estado de Guanajuato en México. Me ha sido de mucha utilidad la explicación sobre el diseño y aprovechamiento del espacio en una cocina de reducidas dimensiones. Muy orientativo. Quisiera saber si Fagor Industrial, dispone de distribuidores en México para poder solicitar su apoyo en este proyecto. Muchas gracias por la solicitud de información e interés. Hemos remitido tu consulta a nuestro departamento comercial y en breve, se pondrán en contacto contigo para facilitarte toda la información que necesitas para equipar un restaurante de 50 comensales. la información proporcionada es muy buena, pero me gustaría saber una forma de calcular la capacidad de la cocina para un restaurante con capacidad de 150 personas, desconozco las necesidades en la cocina por lo que una estufa con cuatro quemadores me parece insuficiente. espero que puedan resolver mi duda para evitar gastos necesario. Requiero diseñar un food truck para sandwich y cafetería, agradeceré indicar la organización e implementación básica para establecer un layout en mi proyecto. ¿Nos podrías facilitar un número de teléfono? Un miembro de nuestro departamento comercial se pondrá en contacto contigo. Para poner mis ideas en computadora y ir mirando cual seria la mejor manera de poner el restaurante seria halgo como para 40 personas . Gracias por tu interés, remitimos tu consulta a nuestro departamento comercial, que se pondrán en contacto contigo lo antes posible. Un artículo muy completo. ¡Gracias por compartir! Necesitaria un presupuesto para una cocina emplazada en una masia para casa rural de unos 50 m2 y capacidad para 40 comensales . Buenos días Sergi, transmitimos tu consulta al departamento comercial que se pondrá en contacto contigo lo antes posible para prepararte el presupuesto que solicitas. Gracias por tu interés en Fagor Industrial, saludos! Buenas tardes Sergi, por supuesto, no te preocupes que volvemos a informarles para que se pongan de nuevo en contacto contigo, un saludo! Hola, quiero hacer la cocina nueva de mi restaurante, me harian un presupuesto? Buenas tardes Sebastian, transmitimos tu consulta a nuestro departamento comercial que contactará contigo lo antes posible para poder prepararte el presupuesto que solicitas. Gracias y saludos! Esperamos que te ayude y muchas gracias por el interés. Buenas noches, voy a montar un restaurante pequeño y me gustaría que me aconsejarais a la hora de montar la cocina . Me gustaría que me deis presupuesto sobre la gama 700. Hola Alberto, en primer lugar, muchas gracias por tu interés en nuestros productos. Remitimos tu consulta a una persona de nuestro departamento comercial que se pondrá en contacto contigo lo antes posible para facilitarte la información que necesitas. Buenos dias, estamos en fase de proyecto para la construcción de un campamento para 120 plazas, y nos surge la duda de montar una cocina para elaborar los menús diarios, o un office para preparar el servicio y contratar un catering. en cualquiera de las dos opciones, nos gustaría su saber su opinión en cuanto a m2 para cada una de las instalaciones y presupuesto aproximado así como, la maquinaria a tener en cuenta, tanto en cocción como en almacenamiento, pensando en que seria un menú único para los 120 comensales, y teniendo en cuenta una futura ampliación para 200 comensales, gracias anticipadas. Buenos días David! En primer lugar, muchas gracias por tu interés en los productos de Fagor Industrial. Transmitimos tu consulta a nuestro departamento comercial para que se pongan en contacto contigo lo antes posible y puedan resolver tus dudas. Buenos días, Soy arquitecto y trabajé con equipos Fagor hace ya un tiempo en la rama de supermercados y minicafetería. El restaurante que estamos diseñando está ubicado en la planta superior del hotel, al igual que la cocina. Quería consultarles sobre el esquema a doptar en la cocina, teniendo en cuenta que pudiera ubicar parte de las areas, como por ejemplo (almacenaje) vinculado al almacen de la planta baja y que contamos con un elevador de servicio. Muchas gracias de antemano y muy satisfecho con la información recibida. Saludos a ustedes. Buenos días José Luis, muchas gracias por tu mensaje, remitimos tu consulta a una persona de nuestro departamento comercial para que se pongan en contacto contigo lo antes posible. ¡Aprovechamos también para desearte mucha suerte en tu proyecto! 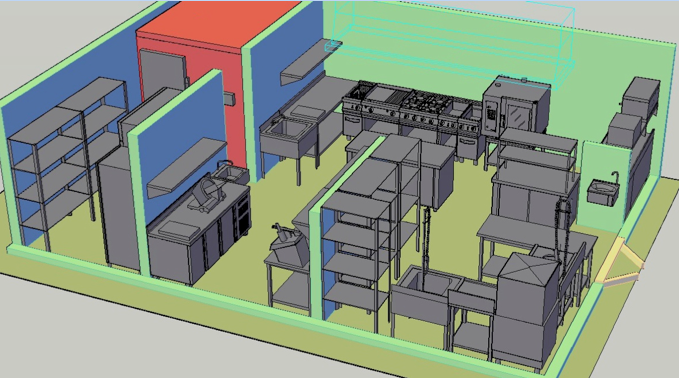 Buenos dias, estamos desarrollando una residencia de ancianos y la configuración de la cocina depende de la potencia de aparatajes. La pregunta es ¿que potencia (Calorifica) tendria una instalación para abastecer una residencia de 50 usuarios? Ya se que dependeria de los aparatos a instalar, por lo que ampliario la pregunta a ¿que aparatos serian necesarios para dos menus (platos del dia)? Normalmente las residencias tienen un solo plato. Gracias por la información del blog, no te das cuenta de la ayuda hasta que no la necesitas. un saludo. remitimos tu mensaje a nuestro departamento comercial para que se pongan en contacto contigo lo antes posible. Muy buen artículo, sobre todo me pareció interesante sobre el bloque de cocción. Yo hace poco entré el campo de cocina, por eso me encantan similares consejos, asi podemos compartir nuestros conocimientos y experiencia. Yo, por ejemplo he tenido un súper decubrimiento, compré una freidora sin aceite. Con lo que es malo el aceite, ahora se puede cocinar que los platos favoritos sean más sanos. Os dejo el enlace https://mejorfreidorasinaceite.es/, a ver si será útil para alguien. Por que a mí me encantó. Me gustaria que me realization un presupuesto para un Hotel 4* con 100 comensales repartidos en dos turnos, desayunos, y zona buffet.Camaras frigorificas y demas equipamiento.El Hotel esta situado en Argelia. Me gustaria que os pusierais en contacto conmigo lo antes posible. Buenos días Jesus, Muchas gracias por tu interés en los productos de Fagor Industrial! Remitimos tu contacto a nuestro departamento comercial para que se pongan en contacto contigo lo antes posible y puedan facilitarte la información que necesitas.